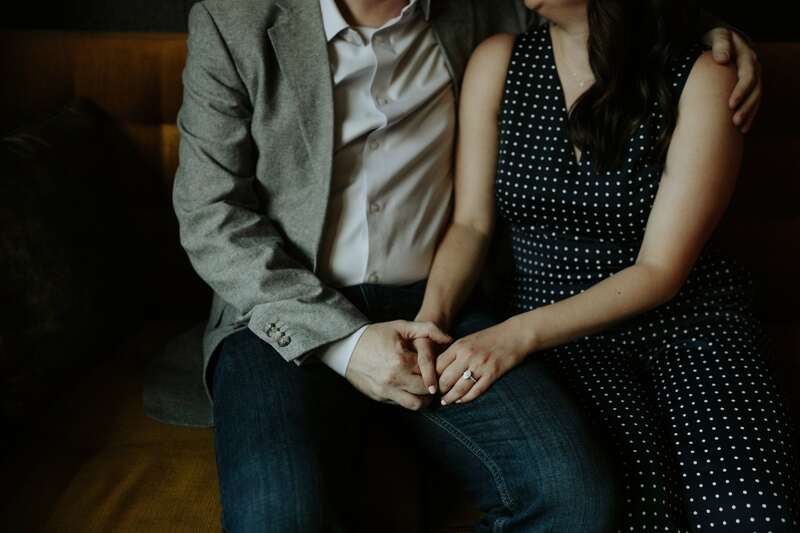 In this story, we’ll take a look at our two lovebirds Brent & Emi and how a Pinterest board helped set up their proposal! It is hard to pick just one instance that I knew Brent was the one. It was a lot of little things and your clique, I could always be myself around him, he always makes me feel special, I wanted to spend as much time as I could with him etc. But the biggest sign was one evening we were watching a movie at his place and he bent down and gave me these funny kisses on my head. I didn’t think much of it at first except that it was cute and so sweet. On my way home that night it hit me and I realized my grandpa would give me the same kisses on the head. Upon this realization I started to cry. My grandpa and I had a very special bond and he passed away a few years ago. Brent and I had a trip planned for Australia and were going to be visiting Sydney and Cairns. When I would tell people we were going I would always get asked if I thought a ring was coming. I had convinced myself that there wasn’t a ring coming (on that trip) and that it was going to be a trip of a lifetime no matter what. 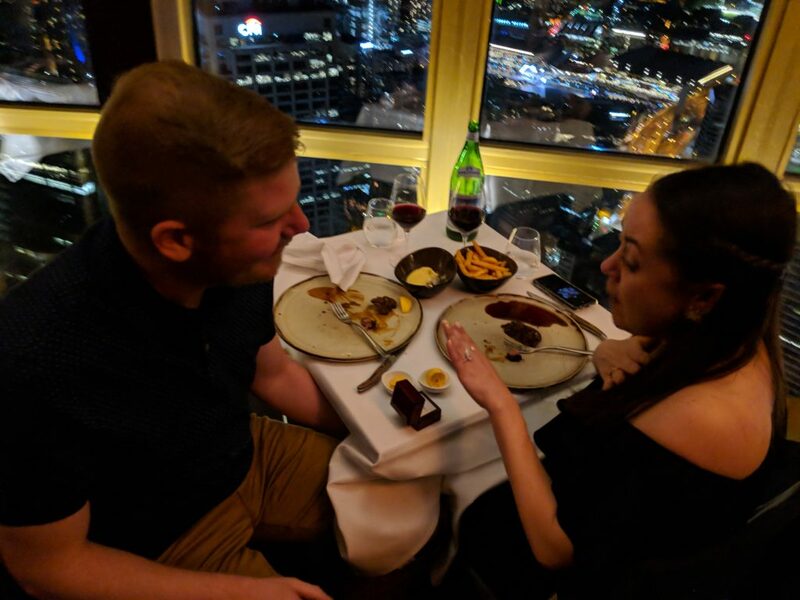 When we were planning everything I really wanted to go to the Sydney Tower for dinner so we made reservations for the second night we were there. The 360 Bar and Dining is an upscale restaurant and rotates with views of Sydney’s skyline. It makes a full rotation every 70 mins. We got lucky and were sat on the outside and were able to take in all the views. I was in awe of it all, the views, just being in Sydney, being there with Brent, it was just perfect! I kept bugging Brent that the next time our waiter came by we needed him to take a picture for us. He kept telling me, ok, or that wasn’t our waiter. All of the sudden during dinner Brent gets up and states, “I have to use the bathroom.” I told him ok, and didn’t think anything of it. Turns out he saw our waiter and told him he was going to propose and when we ask him for a picture, to keep taking pictures. Brent finally asked our waiter to take a picture for us and after what felt like a couple of mins I thought, enough with the pictures, I think we got it. I looked over at Brent and he got down on one knee and asked me to marry him! I was so shocked and amazed at the ring, I couldn’t stop crying. I tried to finish my dinner after that and was such a ball of excitement I couldn’t! Brent was so relieved to have the proposal done with he went ahead and finished mine for me. 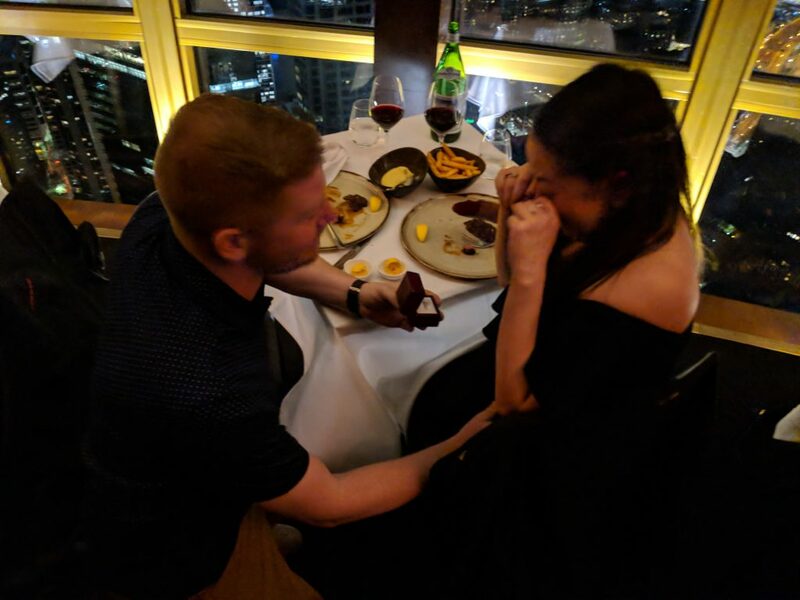 Turns out everyone knew Brent was going to propose except for me! I am so glad everyone kept it a secret from me. I came back to the States with the most amazing “souvenir”. 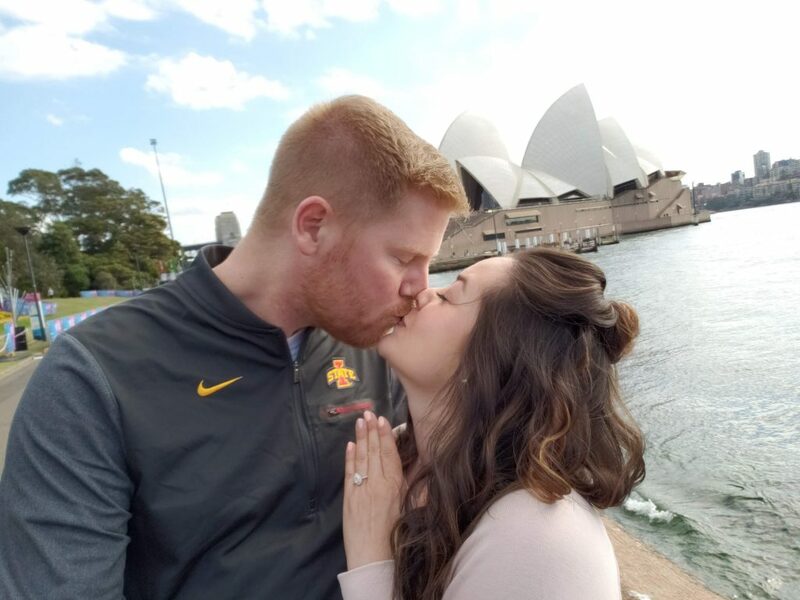 It was the trip of a lifetime and we got to celebrate our engagement just the two of us for a week. I am OBSESSED with my ring! I have always wanted a pear shaped diamond engagement ring and even had a secret board on my Pinterest. It was my dream board, I didn’t think I would ever have something like the pictures I was swooning over. But low and behold, my sister hacked into my Pinterest account when she was helping Brent and found my love of pear shaped diamond rings. My gorgeous diamond stands out even more with the 360 halo! This may sound weird, but the firs time I knew I was in love with Emi, she came with me while I was shopping for a new couch and I am not a fan of furniture shopping but we actually had a great time and made each other laugh a lot while doing it and if she could help make something as mundane as looking for furniture an amazing time, I knew she was the person I wanted to keep making memories with. We went on a trip to Australia which was an incredible experience for us, our second night in Sydney we had dinner at the Winfield Tower, which is the tallest building in Sydney and the floor revolves around the building so you get to see the entire city throughout dinner, I was able to talk with the waiter and let him know I was going to propose and asked for him to take pictures while I proposed. 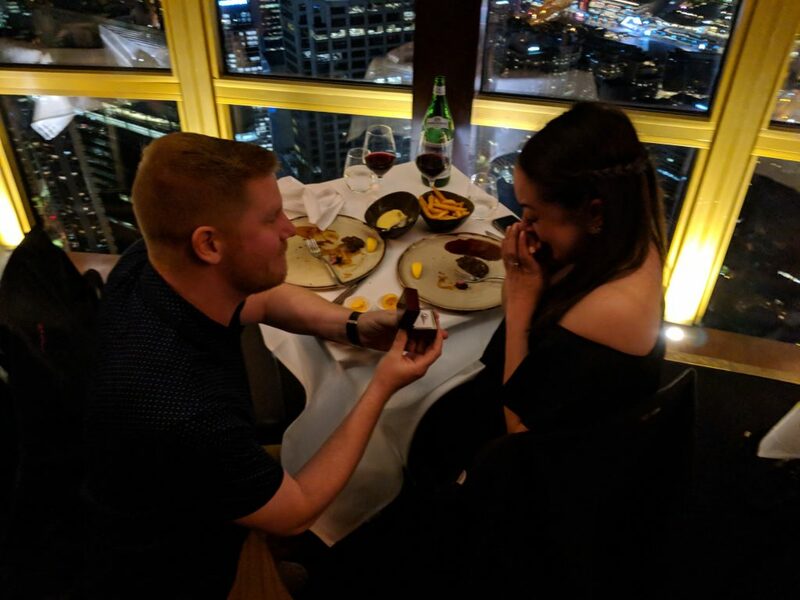 When he came by Emi asked him to take a picture of us, he looked and me and I gave him the nod (saying lets do this) and proposed and she said Yes! I didn’t really know where to start and thankfully Emi’s sister, Jessica helped me check out quite a few places and look at the different kinds of rings and she was able to find rings that Emi had said she really loved. We found that Emi was a huge fan of pear shaped diamonds with a halo around them and I decided on that and Kaeleigh helped make the process so much easier and less stressful than I had imagined it would be. Picking out the diamond and halo option was great because I was able to get something made just specifically for Emi and she absolutely loves the ring and so do I!